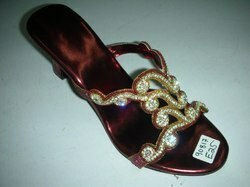 We are offering wide range of Bridal Footwears for Marriage Party. The offered sandals can be worn by the girls of all ages for casual and the fashion purposes. Offered fancy sandals are manufactured by employing superior quality basic material & sole in sync with set market standards. Looking for Bridal Footwears for Marriage Party ?